Jyotirmaya Sharma is a professor of political science at the University of Hyderabad but he is better known as a sharp critic of the Rashtriya Swayamsevak Sangh-sponsored Hindutva agenda. He is different from most other political critics of the saffron brigade because his columns carry the punch of logic. His recent publications include Hindutva: Exploring the Idea of Hindu Nationalism and Terrifying Vision: M S Golwalkar, the RSS and India. He is currently working on the thoughts of Ananda K Coomaraswamy, Rabindranath Tagore and Mahatma Gandhi, while simultaneously working on a book exploring the life and ideas of Gandhiji. He is also editing an anthology of Indian thought. He has been invited to many universities and think-tanks to speak on issues of national importance. Sharma also held senior editorial positions at The Times of India and The Hindu between 1998 and 2006. In an interview with Sheela Bhatt, he shares his thoughts on the movement for a separate state of Telangana, an issue he is able to see from the premise of his own students, some of who belong to the agitating region of Telanagana. How do you view the movement for Telangana today? What is the ground reality? As of today all the political parties have been untruthful and dishonest on the issue of Telangana. In the past they have said something and gone back on those promises. I think there is no party in Andhra Pradesh which has not done it. That's the political situation. But, the ground reality after Home Minister P Chidambaram's statement of December 9, 2009, is that everybody in Telangana actually feels that not only will there be a separate state of Telangana as a consequence of the political demand for one, but that their lives will be vastly improved. They think, once the state is granted rivers of milk and honey will flow. I think a sense of realism is required after 63 years of broken promises and partially fulfilled dreams. There are young men in Talangana who feel they will get jobs as soon as the state is granted. There is a gap between the political leaders, their promises, their rhetoric and what people are thinking and dreaming on the ground about Telangana. There is a groundswell of support for the state of Telangana among common people across Telangana. The problem is if one discounts K Chandrasekhar Rao's past, and all the drama and histrionics that followed Rao's fast -- which was in a certain sense part theatre and part opulent Telugu film garish, loud and mindless -- I don't think his Telangana Rashtriya Samiti, actually, represents the mainstream or the aspirations of the movement for a separate state. Of course, the TRS would have got even more emboldened after the recent wins in by-elections. That's where the problem arises. The problem also arose when journalists across the country, particularly from New Delhi, seem to think that TRS represents the movement. These days journalists in New Delhi seems to see everything from a 24x7 news channel angle. The big question today is, who represents the movement. We don't know who represents the movement for a separate state. We do not even know if there is a leadership that will do right by Telangana and do right by the Indian Constitution. The TRS's argument is that their vote got divided when it had an alliance with the Congress and later with the Telugu Desam Party. Rao, despite all the histrionics, has lost credibility. There is a leadership vacuum. The TDP and Congress, in the state, are under self-delusional confusion about their stand on Telangana. I suspect they are being pulled in different directions by two other regions -- Rayalaseema and Andhra -- where very different sentiments prevail. What's your stand on these issues? There are some uncomfortable questions to be asked. But, few people are asking it. Like; it's not a question of Telangana being given statehood or not. At least, that's not the only question. I have always refused to answer that question. As a political theorist, it is my job to raise fundamental questions. For me the whole concept of linguistic, ethnic and identity-based division of states is over. I do not want to endlessly debate whether it was the right thing to have been done in the past. But the time for dividing people on the basis of primordial identities is over. It may have had a positive role to play in the fifties and sixties, especially as a way of contesting a monolithic idea of Indian nationalism. Today, the greatest challenge for us as Indians is that we must learn to live with each other and not create cocoons for ourselves. When people ask me are you pro-Telangana or anti-Telangana, I say I am also anti-Rajasthan and anti-Tamil Nadu, Bihar etc... I am against linguistic-cultural identity-based states. You are a scholar but don't you think the average Indian has a linguistic-cultural identity? I am searching since the last 40 years for that person called 'an average Indian'. I haven't found him. I think identity politics is an urban phenomenon. I don't think the rural masses are bothered about different things. If you whip up mass emotion, it is a different thing. I don't think the rural Indian masses are bothered about identity politics. The so-called average Indian, if you believe in such an abstraction, is sometimes a bundle of delightful contradictions, and at other times the repository of ideas and actions that are regressive and diabolical. Are you against smaller states as well? There is a great misunderstanding about federalism in India. The Bharatiya Janata Party-National Democratic Alliance model of federalism was one where they confused federalism with creating small states. The Congress's model of federalism has been to let conflicts simmer as long as they don't get out of hand and where there is always an opportunity to reap electoral dividends. Don't people around you in Hyderabad want Telangana? People around me are from the middle-class. They don't believe in anything. That's a sad part of it. They want regular electric supply like any other middle-class Indians. They lack a moral centre. How do you explain the situation in and around the university campus between December 6 and 10 last year in Hyderabad when lakhs of students demonstrated on the campus? A display of emotion is the easiest thing to do in India. We have become notorious in showing our emotions. Dil bhara hua hai, dimag khali hai (The heart is full but the brain is empty). People get emotionally hurt when a book is published, a film is made, a painting is drawn. We are weeping and moaning all the time. Our daily dose of television soaps reflect that inability to be happy. We have not produced any great idea other than Gandhi and his audacious experiment in teaching a very violent people the merits of non-violence. For the past 500 years, we have perfected the art of wailing and blaming each other for our shortcomings. We love moralising and being self-righteous. 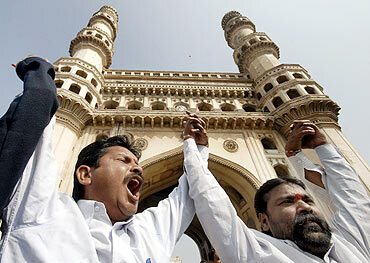 The Telangana movement restarted with the premise that Telangana region was short-changed on all economic indicators. But, then, experts have pointed out that in every sphere of human development, Telangana has done better than Rayalaseema and Andhra. Now, the agitators have dropped that argument. Now, the agitators say our identity is different hence, on the basis of our cultural identity we want a separate state. The problem is that between those who are asking for a separate state and those who oppose it, there is no debate, there is no serious conversation. Every difference of opinion on both sides is sought to be resolved either by violence or by an extra dose of rhetoric. It's a great myth of modern times that people assume that they know their interests! Just as people elect Narendra Modi in Gujarat doesn't mean that it is the voice of the people or that even if it is the voice of the people, they are right in electing Modi. I think that's rubbish. We should go back to the earlier formulation of liberalism by George Stuart Mill where he said that if hundred fools lie and if other hundred believe it, it is not necessarily truth. In Gujarat people are misled, afraid, bullied and they are behind an elaborately spun veil of lies, deception and ignorance. The solution to it is not to give away our lives and our freedoms to some wise man. Wise men can be wrong and often they are, especially if they attempt to run people's lives. My solution is, let things be. Let people learn the hard way. If you say people who vote for Modi are wrong and let's socially engineer their minds and wills, we are doing that very thing that Modi does, and does very successfully. How will the issue play up once the Srikrishna Committee, mostly after a few extensions, submits a report on the viability of Telangana? It will depend on what sort of wheeling-dealing political parties will do before the next election. Political formations will ensure their self-interest first before granting or not granting Telanagana. Within Telangana, is there a unity of purpose? There is neither unity of purpose nor is there clarity about why they want the new state. KCR's son was saying, for days together, on national television that Hyderabad has always been the capital of Telangana. Nobody had the gumption to get up and say don't distort history. Hyderabad was the capital of the Nizam state. Warangal was the capital of what you called Telangana. The Kakatia kings founded a dynasty in Warangal and it spread up to the coastal region. Politics is not always about reason or logic. It is about emotion, intuition, myths. Who has a vested interest in the formation of Telangana? The vested interests seen around Hyderabad today seem to be against the formation of a new state, right? The biggest vested interests who want Telangana are the ones who claim that Hyderabad was a part of Telengana. It simply means the transfer of the real estate lobby and mafia from one set of hands to another. Let us not romanticise Hyderabad's cultural heritage. Do you call biryani and pearls rich culture? The people and food of Andhra are nice but is that Hyderabad's contribution? There is no classical tradition, no folk Hyderabadi tradition. Except money, what is Hyderabad's culture contribution to Andhra Pradesh? There are cities in Telangana, Andhra and Rayalaseema with a greater contribution to the cultural heritage of this state. I like Hyderabad and have chosen to live there. But we don't always have to deify all things that we love? Is there a divide among the residents of Telangana? Yes. Southern Telangana comprises mostly Muslim residents. North Telangana has a close proximity to Maharashtra. In this area, the Bharatiya Janata Party has exploited communal sentiments. There is a north-south divide in Telangana that commentators do not see. Asaddudin Owaisi, leader of the Majlis-e Ittihad al-Muslimin which has a strong presence in Hyderabad, claims that they want some parts of Andhra and Rayalaseema as well to ensure that Muslims are not isolated if and when the new state is formed. 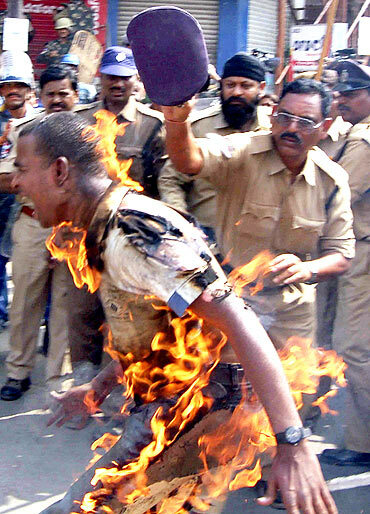 There is a real fear in the mind of Muslims that they might be isolated in the state of Telangana if it is formed. God forbid, if Telangana Rashtra Samiti chief Chandrasekhar Rao is going to be the leader of the movement, I won't trust my life to him in any sense of the term. Across the state, till he went on that fast, he was a discredited leader. It was similar to the situation in the film Guide, where a starving man is made into a sadhu and attains a halo and made larger than life. Many people won't agree with you that there is no distinct identity of a man from Telangana. I have been living in Andhra Pradesh since 12 years. I have not found one (such man). There is no difference between the language of an Andhraite and the language of a man from Telanagana except a few words. Both speak Telugu. Telangana locals have few Arabic/Muslim oriented words and few words taken from Marathi because they are close to Maharashttra. Yes, the cuisine is different but that is so between even neighbouring villages in India. Identity and difference are complex issues and part of what diversity and plurality are all about. It doesn't always have to be translated into politics of the kind we see today. There is also a distinct difference between the cuisines of Rayalaseema and Andhra. Rayalaseema cuisine is very hot and spicy. They can even ask for a separate state because their food is so different from any part of India. What are we talking about? I don't accept identity criteria for creating a new state. Bleeding heart liberals like you who think that every underdog who paints himself as a victim, should know that underdevelopment is prevalent throughout the state. In a TV programme, I said I want a separate state of Film Nagar. That is the area in Hyderabad where I live, because it is less privileged than adjoining areas. The power supply, traffic and roads -- everything is substandard compared to other localities. Even women are less safe here. There will come a time when we will become hostage to these narrow and debilitating notions of identity politics. I think what we instead need is regional autonomy. These new states are not at all deepening Indian democracy. Indian democracy needs political reforms, administrative reforms, electoral reforms, economic restructuring. These are the urgent issues. Chidambaram's late night announcement has opened up a Pandora 's Box. Before the next election in Andhra Pradesh, political parties will need clarity on the issue, otherwise the whole issue will become contentious. And since all parties in the state are dishonest about the issue in the extreme, they will take the state to the brink of chaos, violence and mistrust. How much will this issue affect the Congress? We don't know the Congress's stand on the issue post Chidambaram's announcement. If this statement was made on any other day, nothing of this sort would have happened. 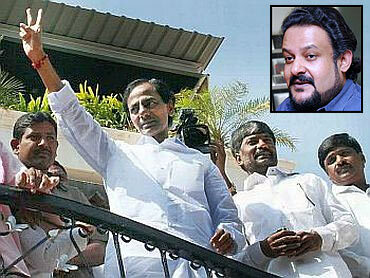 TV screens were screaming that KCR is about to die. Nothing of that sort would have happened. The government overreacted. Do you think the Telangana issue has offered an opportunity to the BJP? The BJP is the biggest beneficiary. This is what the Congress doesn't understand, or if it does, it doesn't seem to have a strategy. The Congress and the Telugu Desam Party got discredited because of the way the issue was handled. The TRS will not be trusted in the long run. The TDP is confused and they have no clear stance. The BJP, on the other hand, has consistently supported a separate Telangana. How do you look at the Srikrishna Committee? Justice B N Srikrishna does have credibility. But I don't think political parties will accept what the committee has to say. It should have been a parliamentary committee. Everybody is buying time. So, you are sure that Telangana will not be created? It does not concern me. What concerns me is that even if it is created, it ought to be done in a way that raises the level of political debate in the country and deepens democracy. In the end what irritates me when people begin to talk about `outsiders' and `settlers'. The Indian Constitution allows me, with few exceptions, to live anywhere I want. I do not need the permission of a political party to live in any part of India. This language of the `outsider' and the `insider' is the language of the fascists. Does the land belong to your family? Is it your private property? The only way you can make me go away is by resorting to violence and the State being impotent enough not to be in a position to protect me. Violence is the last resort of the coward, which is what Indian political parties are slowly tending to be. They have lost credibility and can only make themselves heard through violence. Let us learn to live together without killing each other, without dehumanizing each other. What kind of a nation is this where a few political leaders sacrifice the lives, livelihoods and dreams of the young to fulfill their political ambitions?